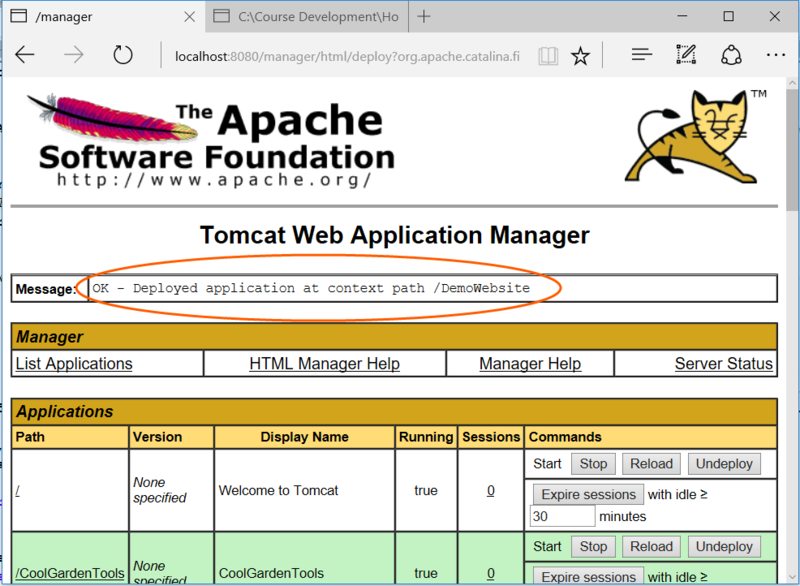 To deploy a web application to Apache Tomcat, you can copy a WAR file to the application base directory, e.g., c:/Tomcat8/webapps. This operation of course presupposes we know the application base directory. We could consult server.xml and look up the Host element to determine the directory name. 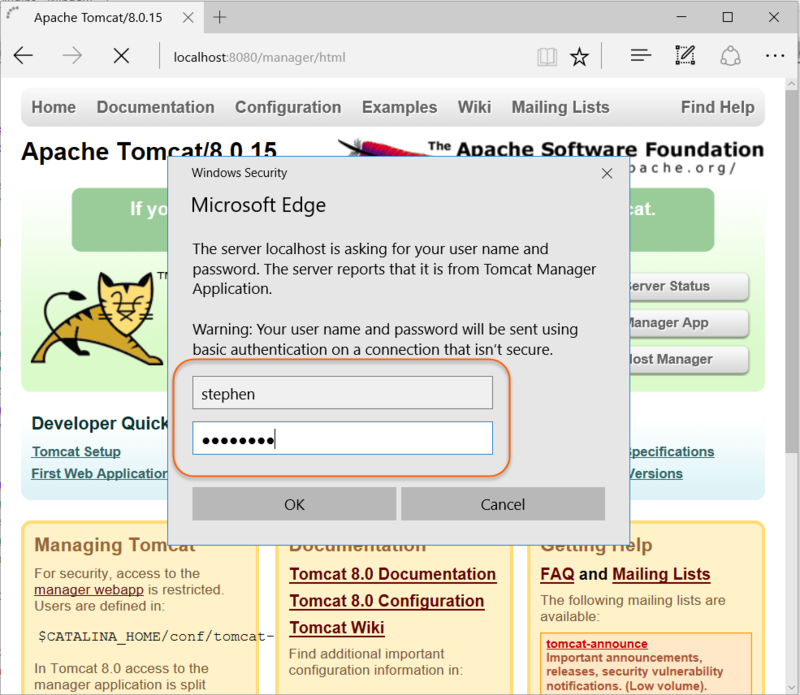 A more straightforward approach, though, is to use the Tomcat manager web application. You will need to edit CATALINA_BASE/conf/tomcat-users.xml, e.g., c:/Tomcat8/conf/tomcat-users.xml to add credentials to access the Tomcat manager web application. Replace "your name" and "your password" with a user name and password of your choosing (no embedded spaces). 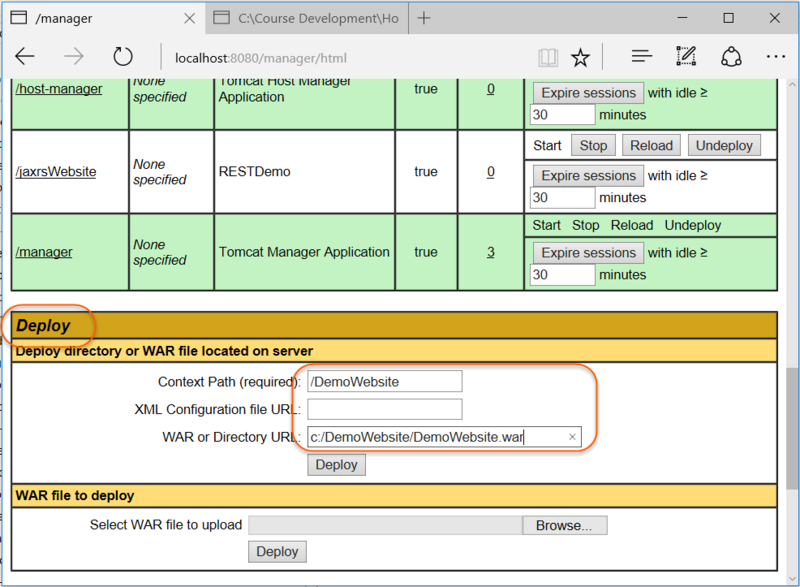 You'll need to create a WAR file so that you will have web application to deploy. The instructions for creating a WAR file were contained in steps 1 and 2 in How to deploy a WAR file in Apache Tomcat (Windows). Complete only steps 1 and 2. If you have already completed that project, delete the WAR file (DemoWebsite.war) and the unpacked folder (DemoWebsite) from CATALINA_HOME/webapps. In the address area of your browser, type http://localhost:8080/manager/html and submit that address to the browser. Note that I have already provided the Context Path (/DemoWebsite) and the WAR URL ((c:/DemoWebsite/DemoWebsite.war) in the text boxes. Fill in the text boxes as I've done. Then click Deploy. In a separate tab in your browser, type http://localhost:8080/DemoWebsite/DateJSP.jsp and submit that address to the browser.